While all of the details haven’t been made official, we know that the 2017 Ford SVT Raptor F150 will be powered by a new, specially tuned version of the tried and true 3.5L EcoBoost V6. Based on comments by Ford execs, this engine should offer around 450 horsepower, which would make the new Raptor considerably more powerful than any other factory-built F150 pickup in Ford’s history. However, based on what we have seen in the past, there is a good chance that this new SVT EcoBoost will be used in other special edition models – while also helping to increase the power levels of the standard 3.5L EcoBoost that has proven to be the most popular engine in the F150 lineup over the past few years. The 2017 SVT Raptor EcoBoost V6 looks comparable on paper to the 3.5L EcoBoost V6 that has been the most popular premium engine option in the Ford F150 for several years now. Where the two different the most notable is in output, as the standard F150 EcoBoost offers 365hp and 420lb-ft of torque while the next generation Raptor is expected to pack around 450 horsepower. During the previous generation SVT Raptor, it was powered by a 6.2L V8 that delivered 411 horsepower and 434lb-ft of torque. This engine was first available in the Raptor, but it was also available in non-SVT pickups during its existence so you didn’t need to buy the pricey Raptor package to get the most powerful engine option in the F150 lineup. As awesome as the Raptor is, not everyone needs or wants all of the off-road capabilities, so being able to get the 6.2L V8 in a less expensive and less off road oriented package was great for those who just wanted the extra power. Based on the past generation, the 450 horsepower EcoBoost V6 in the next gen SVT Raptor could be offered in the non-SVT F150 pickups following the arrival of the new Raptor. While there is a chance that Ford will not offer the exact same 3.5L EcoBoost from the 2017 Raptor in the other new F150 pickups, I would bet a pretty penny that we will see a spike in the power levels of the 3.5L EcoBoost V6 within the next few years. Since being introduced for 2011, this premium engine has offered 365 horsepower and 420lb-ft of torque. During this time, Ram and General Motors trucks have gotten power increases that push the EcoBoost down the list of the segment’s most popular mills. Right now, the Ram 1500’s most powerful engine is the 5.7L Hemi with 395hp and 410lb-ft of torque while the GM trucks have the 6.2L V8 with 420hp and 460lb-ft of torque, so the premium EcoBoost V6 has a little more torque than the Hemi, but less torque than GM’s 6.2L V8 and less horsepower than either of the competitor’s most powerful engines. If the 2016 SVT Raptor EcoBoost V6 does offer 450 horsepower, I would expect the torque output be up in the range of 475lb-ft of torque. Those figures will make the Raptor the most powerful half ton truck in America, but those figures do seem a touch high for a “normal” Ford F150. 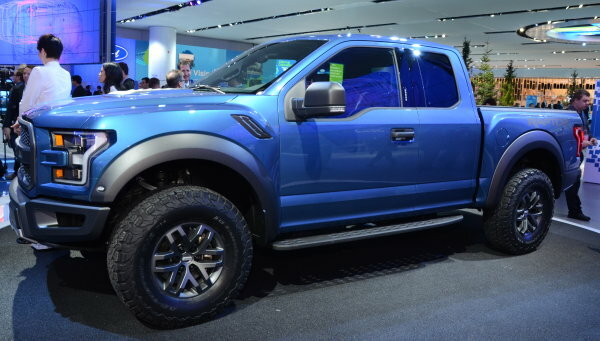 However, if Ford detunes the SVT EcoBoost a bit – say down to something like 425hp and 460lb-ft of torque – the Motor Company would be able to brag about having the most powerful normal production (not a special edition) half ton truck on the market. Bragging rights are a big deal in the half ton truck segment so with tons of potential power in this new SVT EcoBoost, I fully expect to see a revamped 3.5L EcoBoost V6 in the future F150 engine option list. It might not have the same incredible power output as the Raptor, but these SVT tuning efforts will almost certainly lead to more power in the high volume Ford pickups.